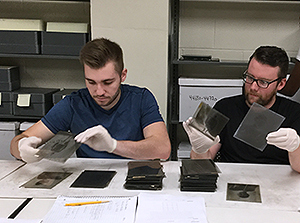 Collaboration between the museum studies program and the Buffalo History Museum provides students with hands-on experience preserving the Howard D. Beach Glass-Plate Negative Collection. 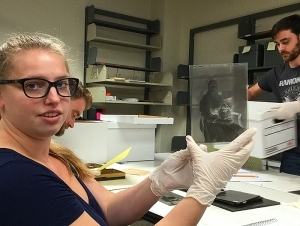 In the digital museum collections course taught by Noelle Wiedemer, ’14, lecturer of history and social studies education, students pursue individual projects that involve cleaning, digitizing, and repackaging glass plate negatives from the Beach collection. “We brought the boxes containing the negatives from the World War I era—1917 to 1919—from the museum to Butler Library,” said Cynthia Conides, associate professor of history and social studies education, director of the museum studies program, and curator for special collections at the Buffalo History Museum. She said the students will present an exhibit about Buffalo in World War I in observance of the war’s centennial next year in Butler Library. “We weave theory and practice in every course,” said Wiedemer. With the help of Buffalo State students, roughly 3,000 negatives have been digitized. That leaves about 54,000 to go. The extensive collection reflects Beach’s career in Buffalo from 1884 to 1935, the year his business was no longer advertised. The collection also includes work by three other photographers with whom he worked—Eleck Hall, Edith Richardson, and Andrew Simson. Beach was an internationally known photographer whose subjects included Buffalo’s leaders from that time: the Darwin Martin family, Elbert Hubbard, and the Butlers. But the collection also includes men in uniform and high school students. Because the collection also includes Beach’s catalog describing each photo—the subject, the date, and notes—students can identify the people in the photographs. Knowing the name leads to more research, and family connections are often uncovered. Kirsten Teeling (pictured at top), who is pursuing a master’s degree in museum studies, said, “I’ve learned how to understand portraits better.” Wiedemer explained that early photographers followed the conventions of painted portraits, which often conveyed information by the composition of the likeness. When a woman was pictured with a dog, for example, she was being shown as a nurturing caregiver. Murphy is a history major with minors in art history and museum studies. He has completed internships at the Resource Center for the Buffalo History Museum, where he worked with material related to the Buffalo Bills, and at the Burchfield Penney Art Center. He has begun a new internship at the Burchfield Penney, working on digitizing material.